Swift Level practices thoughtful and knowledgeable animal husbandry and land management with respectful treatment . Swift Level is chemical, pesticide and herbicide-free, which means our animals are too! Our steers grow naturally on managed forages, we never feed any grain. Building healthy soils and growing abundant forages is our goal. 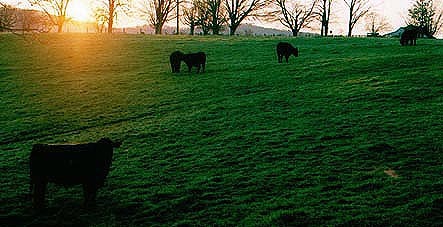 To do so we move our cattle quietly from pasture to pasture as dictated by nature, moisture, forage growth and season. The cattle are our soil builder, we do not fertilize with anything other than organic compost from the cattle. We believe that hills, movement and normal activity support healthy animals with bodies that are strong, organs that are clean and cattle that seem to be quite content. Our carcass quality shows the end result met by a strong customer demand, great chefs/ restaurants, households, retail and the market place. We guarantee that our steers are not harassed, electric-prodded or stressed in any unnecessary manner. We work very closely with the processing of each steer. Our beef dry hangs for a minimum of 35 days and is USDA inspected. Each steer is individually and carefully processed to our specifications and your ordering needs. Each steer is tracked from birth to the individual package of meat providing the entire history of the meat you are eating. We welcome visitors and encourage pasture walks and tours to help you better understand the importance and impact of this farming methodology. Carbon sequestration is a direct product of how we manage our cattle, and I am known to be passionate in how to better understand the economy of supporting the non conventional ranches and farms in the country, to see the amazing role they play in supporting their communities and feeding you great, healthy foods. Pricing is by the desired cut and weight per pound and there is no minimum order. All packaging is vacuum sealed and frozen the day it is cut unless specified otherwise. We process every other week and we do suggest ordering ahead if you know of something special you have in mind or would like your meat to be fresh and not frozen. We offer single muscle grinds, from one steer, per package. We are happy to ship (which is at an additional cost to you). Our lovely retail shop in Lewisburg has a well stocked inventory of our beef, lamb, pork, chicken and eggs from selected local farms. We accept all credit cards, check and cash. ​We are not a factory line type of business, each piece of meat is carefully hand cut and trimmed. When ordering, please let us know what you desire and we will do our very best to obtain.